Eddie McGuire was forced to apologise for the comments. Source: Twitter/Sunrise (left) and Getty (right). Eddie McGuire has been forced to issue a grovelling apology after slamming a double amputee plane crash survivor after she visibly struggled to do the coin toss during an AFL match. Banham lost one leg and part of the other when she survived a plane crash in 2007, and walked on to the pitch using a walking stick to do the toss. 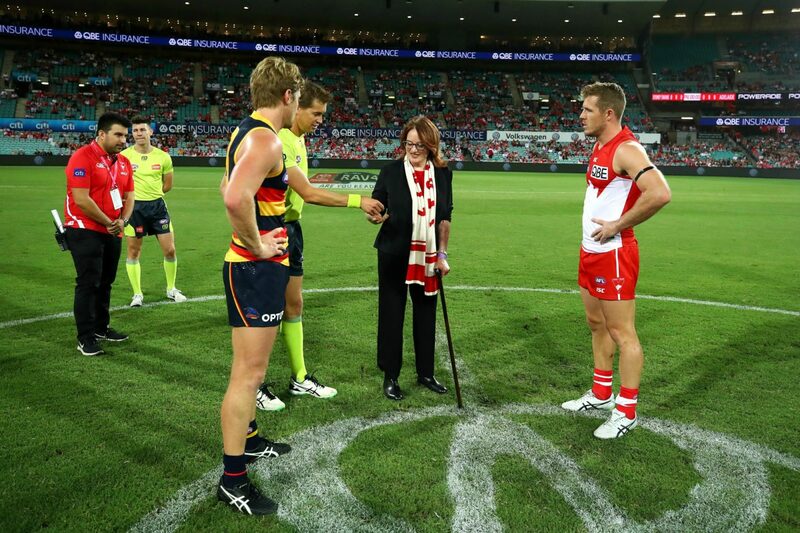 However, she struggled to balance with the stick while also tossing the coin – sparking McGuire’s controversial comments while on the panel of Friday Night Footy. “I think we should issue a $5,000 fine for anybody who is tossing the coin and can’t do it properly,” McGuire said. Cynthia Banham appeared to struggle with the coin toss. Source: Getty. “Every week we have someone dropping it on their foot. Come on, toss it up properly for goodness sake. Practice in the week, you know you’re going to do it. It can’t be that hard can it guys, seriously,” he added. The Sydney Swans released a club statement after hearing the comments following the match, condemning his remarks and saying they felt “incredibly disappointed” by them. “The comments show not only a lack of empathy, but also ignorance,” the statement read. “Cynthia Banham is a passionate Sydney Swans member, our number one ticket holder, and a courageous woman who is an inspiration to all of us at the club. She was one of the key figures behind our Diversity Action Plan. McGuire issued an unreserved apology at halftime, insisting his comments weren’t aimed at Banham directly. Banham famously survived the 2007 Yogjakarta plane crash that killed 21 people, including five Australians. She had been in Indonesia working at the time, before catching the Garuda Flight 200 from Jakarta. She was left with a broken back and burns to 60 per cent of her body, before an infection meant she lost both of her legs. However, she has since gone on to achieve a Doctor of Philosophy and a Masters in International Affairs, and is now a Swans ambassador and Sydney’s No.1 ticket holder. The comments sparked a huge backlash online, as many Twitter users hit out at McGuire for the remarks. Did you watch the match? What do you think of McGuire’s comments and subsequent apology?